His Serene Highness, Prince Robert de Rohan Courtenay 1961 in Grenwich Village. Photo by Diane Arbus. The Prince was born in Oklahoma. In the 50s and 60s he laid claim to the Byzantine and Holy Roman Empire. 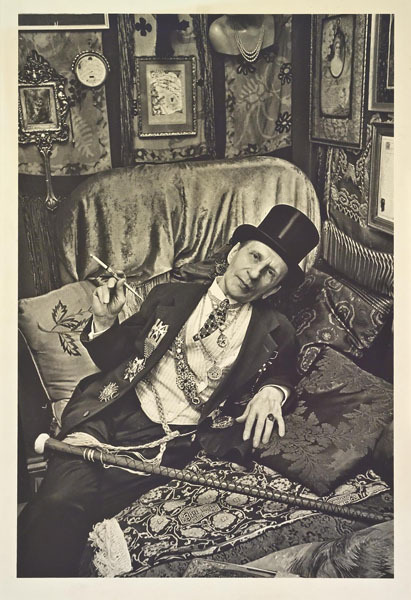 As is evidenced by the photograph, he lived in a highly baroque 1.83 X 2.74 meter room on 48th Street in New York City where he wrote poetry, often in a language of his own devise that appeared to be related to pig latin. While he never achieved the fame of Emperor Joshua A. Norton III, it must be remembered that Emperor Norton had the advantage of living in San Francisco.